SubstanceNG is a re-implementation og the Substance Gem provided by default for Lumberyard. 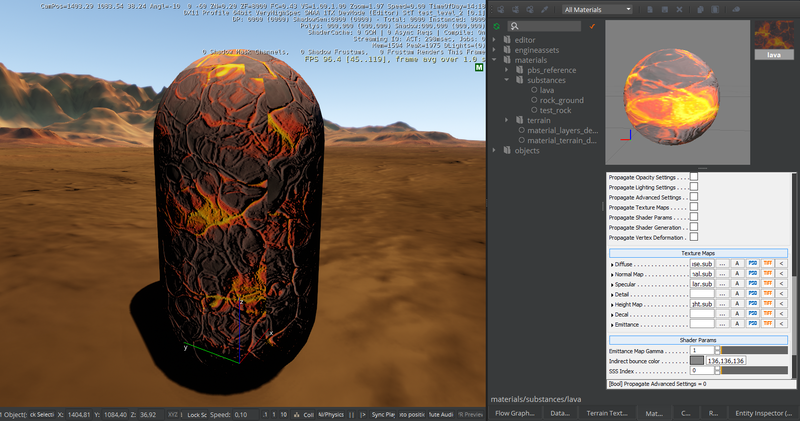 I initiated this project when we realized while working on Lumberyard game that the default Substance Gem had serious limitations: mainly, it seemed to be used an old version of the substance engine, and thus, could not be used to load substance archives generated from Substance Designer 6 for instance (some simple substances could still work, but not the one using the new substance engine 6 features (?)). So I started with some investigation on the available Susbtance plugins for the major engines, and in this process, found the Susbtance plugin for Unreal Engine 4. 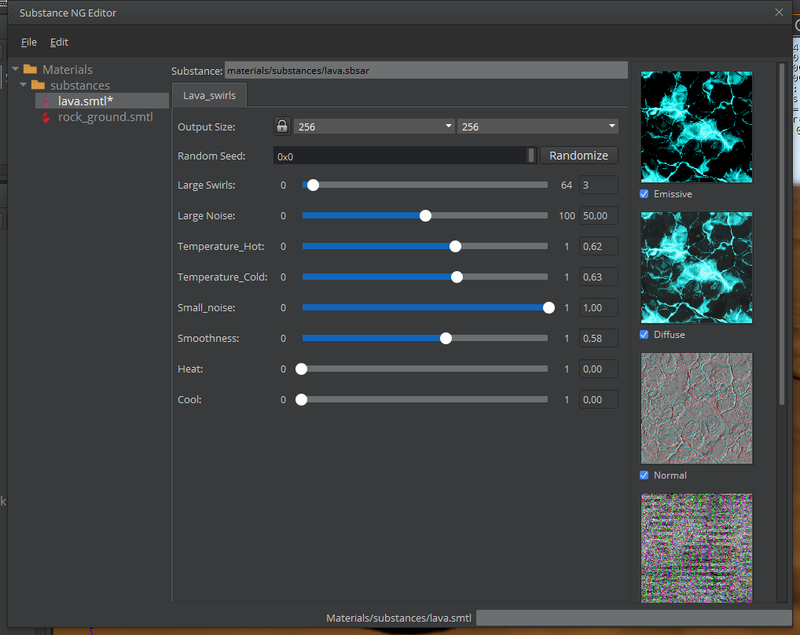 I downloaded this plugin, and analyzed the sources which were using a completely different API to access the substance engine. Turned out this version was using the substance engine 6. Thus I started with a copy of the Substance Gem sources, and updated them progressively to incorporate this latest version of the Substance engine, and get ride of the all version in parallel. Support for emissive outputs from substance archives. Support for Lumberyard material reloading when input parameters are changed and saved on a given substance. Yet, for the moment, many of the flow graph nodes available in the legacy Substance Gem are not available yet in this Susbtance NG gem. To be added later . The sources for this project are available on github. 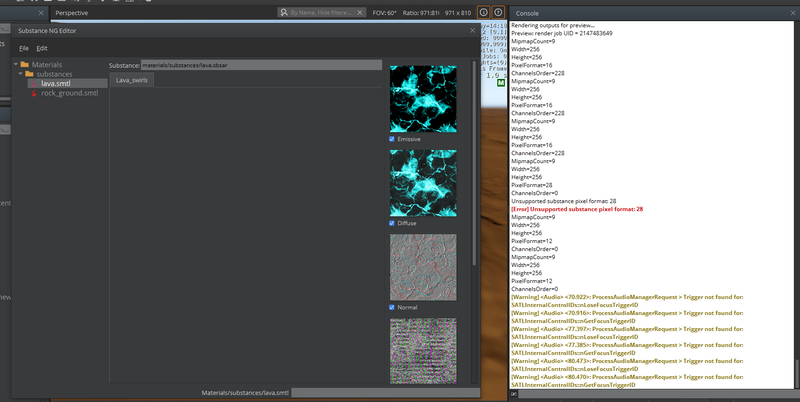 Also, note that the Substance Editor menu tool bar button is not working with this new plugin. # could also add: 'substance_d3d11pc_blend_static' as engine ? We should use SystemFile to read the content of a file. We needto provide a full path for our file to be able to find/open it. Got an error when updating the EBus interface for virtual bool CreateProceduralMaterial(const char* basePath, const char* sbsarPath, const char* smtlPath) = 0; ⇒ It seems we still reference the Subtance includes: OK fixed. So, the next step is the call to GetMaterialFromPath: note that this method should return NULL if the material file doesn't exist yet. OK: we now have support for proper import of sbsar files. Where on earth do we specify that *.smtl files should be read as substance materials ?! Note: maybe ambient occlusion can be activated with the EFTT_OCCLUSION slot ?